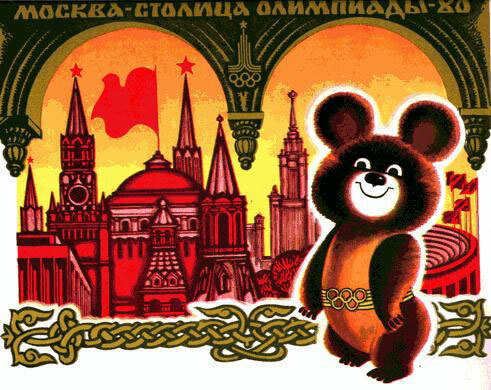 Despite the stigma that the 1970s was an era of stagnation in the Soviet Union, in 1974 the International Olympic Committee unanimously voted to appoint Moscow as the host city for the 1980 Olympic Games (Olympic Boycott). Beyond athletics, hosting the Olympics was a huge opportunity for the Soviet Union to showcase its prominence and economic prestige on a global scale (Moscow Olympics). 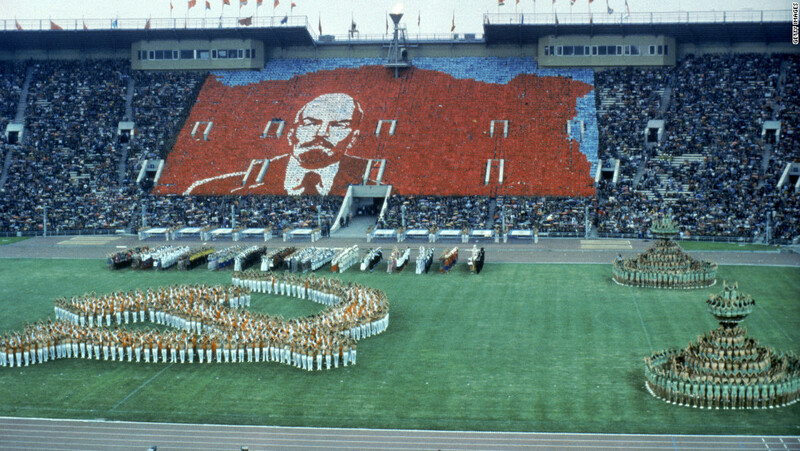 In fact, the Soviet Union had historically used public spectacles similar to the Olympics, such as street festivals and circuses, to promote nationalism and well-being amongst its population (Moscow Olympics). As such, the USSR set forth on drastically improving the infrastructure and overall image of Moscow. In addition to the construction of facilities designated for athletics (many of which were converted to housing after the Olympics), the streets, buildings, and decoration of Moscow were revamped considerably (Moscow Olympics). At this time, relations between the USSR and the United States remained bitter. So bitter, in fact, that as response to the Soviet invasion of Afghanistan in 1979, the United States (along with 55 other states) decided to boycott the 1980 Moscow games (Moscow Olympics). However, the USSR interpreted the United States’ decision to boycott the 1980 Olympics as a direct reflection of the personal ambitions of President Carter, whom had initiated an ‘anti-Olympic council’ that undermined the traditions of the Olympic Games (Olympic Boycott). Furthermore, it was propagated in the Soviet Union that Carter’s decision to boycott the Olympic Games was a strategy to distract the American public from a variety of domestic problems and hardships (Olympic Boycott). New York Daily News headline announcing President Carter’s ultimatum to the Soviet Union regarding U.S. participation in the 1980 Olympic Games. The USSR portrayed the U.S decision to boycott the games much differently. In actuality, the American response to their government’s decision not to participate in the Moscow games was not as favorable (The Anti-Olympic Farce Fails). President Carter held a ceremony to honor the United States 1980 ‘Olympians’ whom were unable to partake in the Olympic games, following the U.S’s decision to boycott the games altogether. The speech and ‘program of Olympic Glory’ ended up being an embarrassment for the entire Carter Administration, whom compensated the U.S. Olympians with ‘fake gold medals’ (The Anti-Olympic Farce Fails). Over 150 U.S. Olympians chose not to attend Carter’s speech, which was greeted by sheer silence (or a ‘boycott of silence’) from the Olympians that did attend (The Anti-Olympic Farce Fails). The USSR remained very bitter about the U.S.’s decision to sit out the 1980 Olympic Games, calling the boycott a result of ‘selfish political ends’ (Olympic Solidarity). However, as I have written about periodically in this course, the Soviet Union responded with very hypocritical behavior. In 1984, the Soviet Union decided to boycott the Los Angeles Olympic Games themselves, which seemingly contradicted the criticisms they made just four years prior that boycotting undermined the legitimacy of the Olympic Games and that the Olympics should not be used for political means (Olympic Solidarity). Anger towards the United States for boycotting the Olympics for political purposes was also contradictory when you consider that the Soviet Union, from the beginning, intended to use their position as host of the 1980 Olympic Games as a platform to broadcast their power and superiority to the world. Whether it be the Revolution of 1917, the First World War, or Stalin’s first five-year plan, food shortage and famine always seemed to be a recurring problem in Russia during the 20th century. Food shortage in Russia has also led to the derailment of many grandiose agendas – such as Stalin’s massive state building and city rebuilding plans. Khrushchev seemed to understand this dilemma; in 1954 he stated, “There will be no communism if our country has as much metal and cement as you like but meat and grain are in short supply” (Corn Campaign). Khrushchev set out to deal with the Soviet livestock shortage by increasing the output of corn. From 1954 to 1962, corn acreage increased from 4.3 to 37 million hectares, which produced massive corn harvests initially (Corn Campaign). 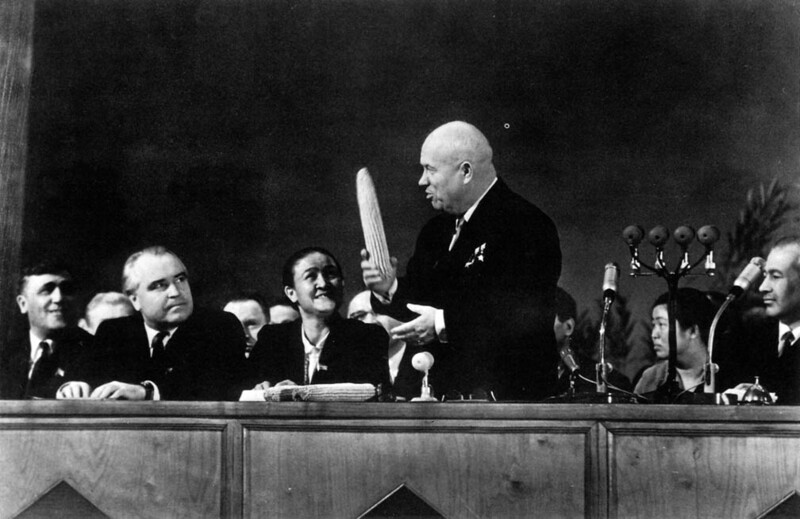 Khrushchev holding an ear of corn at a conference in 1957. The early success of crop yields in the mid/late 1950s did not carry over into the sixties, however. The Soviet government continued to place priority on the expansion of corn acreage at the expense of working towards innovation and improvement of growing and harvesting techniques (Corn Campaign). Following a few years of poor weather, and ill-advised expansion into infertile terrain, crop fatality rates exploded (70-80% in 1962) and overall crop yields lagged far behind their rates of expansion and labor input (Corn Campaign). From 1961-1965, nearly one quarter of Soviet investment capital (23%) was dedicated to agriculture, and while the United States investment in this sector dwarfed in comparison (4%), the Soviets did not reap a substantial return on this investment with their crop yields (Freeze, 441). 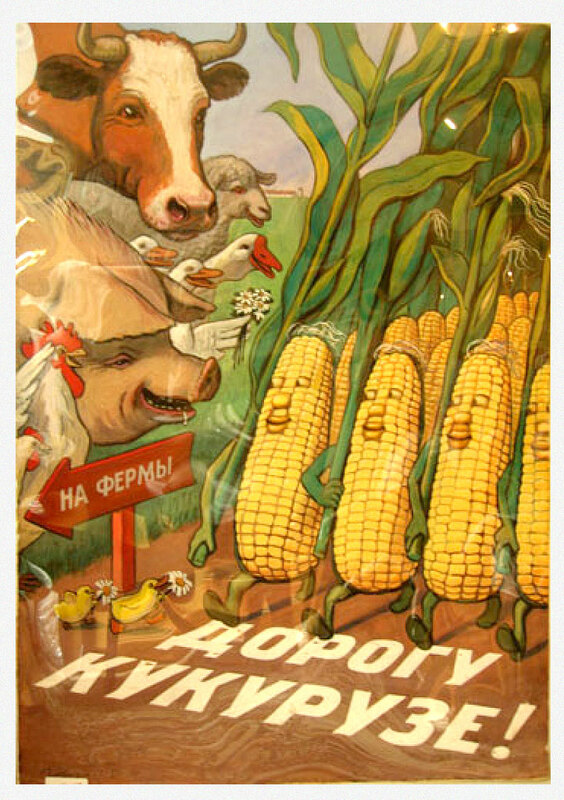 Soviet ‘Corn’ Propaganda: Corn as solution fix the shortage of livestock. In 1959, Khrushchev travelled to the United States to meet with Iowan corn farmers in somewhat of a quasi-corn seminar (Khrushchev in Corn Country). Ironically, and almost comically (to me), Khrushchev stated to the Iowans that God had helped them a lot, but assured them that the Soviet Union’s corn growing capabilities were improving rapidly, that God was on the Soviet Union’s side, and that the USSR would soon, “surpass everything in the United States” (Khrushchev in Corn Country). I find it ironic how frequent and heavily Khrushchev uses the notion of God, and God’s blessing when discussing corn capabilities, especially considering the fact that Khrushchev himself was an atheist (Khrushchev in Corn Country). 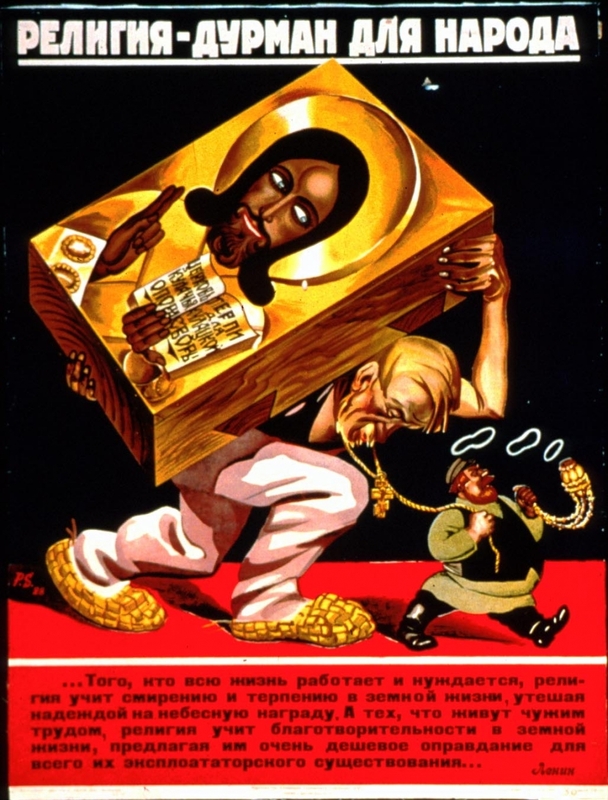 Furthermore, although religious persecution was relaxed during the ‘Cultural Thaw’, religion has historically been the subject of an inferiority complex in Russia (from the Marxist ideology of religion as the opiate of the people to practices of the Komsomol to Stalin’s anti-religion campaign). Regardless of the discrepancy between Khrushchev’s beliefs and words on religion, his corn campaign was ultimately a failure, bringing about damages to both Russia’s agricultural system and his political reputation (Corn Campaign). Click here for a video of Khrushchev discussing his visit to Iowa on corn. In the years immediately following the death of Joseph Stalin (1953), two ‘trends’ or ‘shifts’ in particular took place throughout the Soviet Union. For starters, a de-Stalinization of sorts was set into motion throughout the motherland (Freeze, 413). In addition to attempts to diffuse and/or move away from the ‘cult of personality’ following his death, there was a great degree of silence regarding Stalin, which signaled a political shift away from the former tyrant (Freeze, 413). Examples of said silence included the discontinuation of recognizing Stalin’s birthday (can you imagine if the United States annually celebrated Obama’s birthday), choosing not to rename the Komsomol after Stalin, and much more (Freeze, 413). The de-Stalinization was even evident among some of Stalin’s former political officials. In particular, Khrushchev criticized Stalin was over-praised and given too much credit, even calling him a demigod (Freeze, 414). In addition to de-Stalinization’, the Soviet Union at this time underwent a cultural thaw, a name derived from Ehrenburg’s 1954 novel, “The Thaw” (Freeze, 413). The term is generally used to describe the cultural and intellectual shift that occurred in Russia during the mid-1950s to early 1960s (The Thaw). For example, religion (which had been persecuted heavily in Russia in previous decades) saw a transformation toward more tolerance (Freeze, 413) . Also, the government opened the Kremlin to outside visitors in 1953 (Freeze, 413). Collectively, these were instances of the government attempting to move away from the brutal repression and secrecy that existed under Stalin. While the Soviet Union’s efforts of increased cultural openness, combined with attempts to move away from its former oppressive tyrant should be seen as a positive trend in Soviet history, it is important to note that such transparency and openness did not extend to all arenas. In 1953, The Soviet Union detonated a hydrogen ‘super-bomb’, a project which had begun back in 1946 (Hydrogen Bomb). Prior to the testing of this ‘super-bomb’, the Soviet Union had detonated three nuclear bombs during Stalin’s regime, and would go on to test 16 nuclear bombs (three hydrogen) from 1953 to 1955 (Hydrogen Bomb). This ‘super-bomb’, was developed on the concept of physicist Andrei Sakharov’s ‘layer cake’ model (Hydrogen Bomb). The ‘layer-cake’ model consisted of lithium-6 deuteride with tritium, and uranium-238, and brought about two major advantages (Layer-Cake Test). For one, this design was significantly stronger than previous nuclear bomb designs. The ‘layer-cake’ model produced a bomb that was estimated to be 30 times more powerful than the atomic bomb detonated on Hiroshima by the United States in WWII (Hydrogen Bomb). Secondly, the ‘layer-cake’ model was a compact bomb that could fit inside an airplane, which made the weapon more transportable and more threatening/ useful (Hydrogen Bomb). Amidst these developments was political fallout, however, as Georgii Malenkov, “referred to the danger of a new world war, which with modern weapons means the end of world civilization” (Hydrogen Bomb). However, such commentary, “went beyond what Khrushchev and other party leaders were willing to acknowledge publicly”, despite the alleged ongoing trend of openness and liberalization in Russia (Hydrogen Bomb). The holocaust is arguably the most notorious aspect of World War II. While millions of Jews lost their lives during the Holocaust, it is easy to forget that they were not the only group victimized by the Nazi’s systematic and brutal tactics of annihilation. Massive amounts of Poles, Slavs, gypsies, mentally disabled, and Russian prisoners of war were also slaughtered, starved, and worked to death by the Germans (Holocaust). In fact, an estimated three million Russian POWs perished in concentration camps alone (Holocaust). This systematic targeting of select groups of people, or rather ethnic cleansing, was not solely used by the Nazi’s during World War II, however. Sympathetic as one may be to the Russian POW’s, Russia itself also deported or relocated upwards of one million people, including the Chechens, Ingushi, Karachai, Balkars, Kalmyks, Meskhetian Turks, and Crimean Tatars (Deportation of Minorities). Furthermore, some 400,000 Russians of German descent were shipped east to Siberia and various other Asian regions (Deportation of Minorities). These groups of people were targeted for relocation by the Soviet government on accusations of colluding with German occupiers (Deportation of Minorities). Additionally, within the span of nine months from 1941-1942, hundreds of people, especially Chechens and Ingush, deserted the Red Army and the military draft (Chechen Traitors). In short, the previous claims of treason were eventually revoked and most of the groups were permitted to return to their original locations (Deportation of Minorities). Regardless, the process of removal and relocation was successful for the Soviet government but at the same time incredibly forceful. The NKVD had the capability of removing thousands of people from their residencies in a single night (Deportation of Minorities). Perhaps the most disturbing aspect of the cleansing was that the NKVD’s means of transportation for removal was supplied by the United States via the lend-lease agreement (Deportation of Minorities). That is, supplies and vehicles essentially donated by the United States were used in part to forcibly remove and relocate certain demographics of people in the USSR, a process in which the USSR killed countless people. While straying from the topic of class, this example highlights the danger and potentiality for abuse when it comes to the U.S. supplying foreign aid to states in need. One common denominator that caused significant problems throughout the 20th century in Russia seems to be its lack of continuity and inability to function in unison. This is particularly troublesome when you consider how geographically large and diverse the Russian population is. From the early 20th century revolutions which pitted a proletariat vs. bourgeoisie dynamic, to Stalin’s political and military purges that massively weakened Russia’s capabilities as discussed in class, to the ethnic cleansing/ relocation of internal groupings of people, it seems there has always been massive internal chaos and tension (Freeze, 376-377). 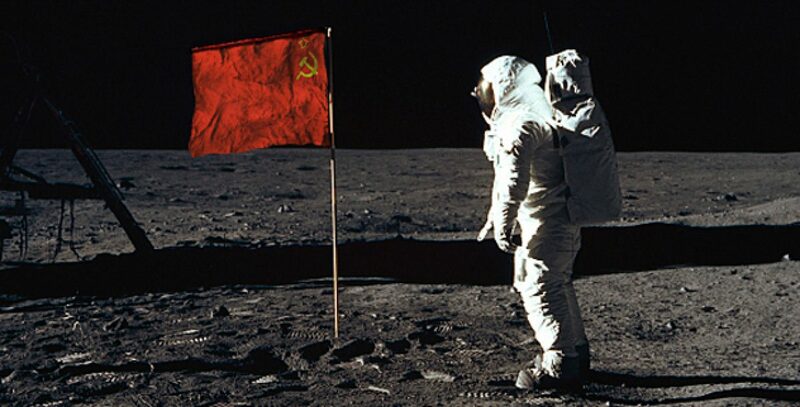 This inability to efficiently function and coexist within its own state later transcends externally, with the USSR’s resentment toward western/capitalist states and particularly the United States in the Cold War. On a very crude level, it seems that Russia just cannot get along with anyone, including itself. Freeze, Gregory L. “Russia A History” (pg. 276-377). Author mikegjormandPosted on February 15, 2016 6 Comments on Bolshevik Party: The Antichrist? Leading up to the revolution of 1905, Marxism began gaining considerable steam all throughout Russia. Karl Marx himself, the creator of Marxist theory (along with Engels), was fundamentally a historical materialist. Marx adopted the principle of Hegel’s idealism (which asserted that history was driven by conflict over ideas) but substituted the root of conflict from ideology to materialistic. Marx also subscribed to the notion of the Hegelian Dialectic. The dialectic presupposes that there is a thesis, which represents the dominant element in a particular period of history, and that an antithesis arises in opposition to the original thesis. The result is a synthesis, which subsequently becomes the thesis of the next era or mode of production in history. 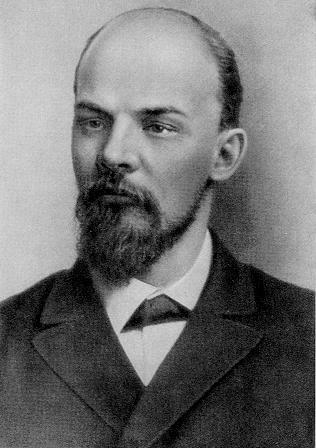 Vladimir Lenin himself was a Marxist, and a major player in the efforts leading up to the revolution of 1905 (and later 1917). Perhaps the most intriguing connection between Marxist ideology and Lenin was the acknowledgment and emphasis placed on class-consciousness. Marx states that society is the history of class struggle with class-consciousness being paramount to ignite the process of overcoming such struggle. In “What is to be done”, Lenin too places great importance on the presence of class-consciousness. Throughout the literature, Lenin frequently refers to previous Russian attempts at revolt and uprising in the 1870’s and 1890’s. He asserts that such attempts failed in part because they did not represent social-democratic consciousness. Instead, he says such revolts were ‘embryonic’ in form and were nothing beyond mere trade union disputes. This reminded me of Klasse Fur Sich, a term that comes up in Marx readings which stands for ‘class for itself’. This term refers to class, as a collectivity of people within a political and economic structure that look out for their interest as a whole, not on an individual level. Reading about Lenin’s views on Marxism and revolution also eerily reminded me of the Nazi movement in Germany, which would occur a few decades later. In talking about the revolutionary movement, Lenin states, “[…]we had both the spontaneous awakening of the working masses, their awakening to conscious life and conscious struggle, and a revolutionary youth, armed with Social-Democratic theory and straining towards the workers”. Thereafter in the article, Lenin refers to the importance of acquiring the support of both the working class and revolutionary youth in order to succeed as class-conscious revolutionary entity. Such demographics, the working class and youth, ironically were also the prime targets of support amongst the Nazi Party. Seems a little chilling to me. This is an image of a man standing on a small wooden dock along the Mariinskii Canal system. Construction of the canal system began in the early 1700’s and has undergone several modifications and expansions since then.1 The canal system, later renamed the Volga-Baltic Waterway, connected the northern part of European Russia and the Volga River with the Baltic Sea. Spanning over 1,100 km, the Volga-Baltic Waterway is a prime example of economic modernization that mobilized toward the end of the Russian Empire, playing a crucial role in both transportation and trade. 1 The vast majority of the Russian Empire was agrarian, and Russia was one the largest exporters of agricultural goods in the world. The Volga-Baltic Waterway enabled Russia to better connect this strength with the rest of the world through trade. Furthermore, the Volga-Baltic Waterway linked the rural interior of Russia with the industrial area of St. Petersburg. 1 In addition to external trade, the Volga-Baltic Waterway facilitated the transfer of various manufactured goods and agricultural goods between the industrial and agrarian regions of the empire. Such intra-connectedness is paramount for an empire the size of Russia, let alone a state in general. Aside from being a display of economic modernity and increased trade/ travel, the man displayed makes this image particularly intriguing. From the turn of the 20th century to the fall of the Russian Empire in 1917, the average male life expectancy did not exceed 40.2 Regardless, the man in the image is believed to be over eighty years of age. The man, Pinkhus Karlinskii, was the supervisor of the Chernigov floodgate along the Volga-Baltic Waterway. The age of the man in the picture almost serves as an unintentional foreshadow of the effect of the Volga-Baltic Waterway. It is not unreasonable to assert that improved modes of transportation, such as the Volga-Baltic Waterway, would bring about a greater quality of life and life expectancy for surrounding citizens impacted by the structure. As stated, such systems enabled greater transportation of goods, such as food, medicine, and other various materials. Connecting rural farmers and their families with industrial regions could also increase their access to higher quality healthcare, granted they had sufficient money. In fact, the average life expectancy in Russia greatly increased following the turn of the 20th century all the way up to post WWII. 2 While the empire fell, structures of economic modernization such as the Volga-Baltic Waterway remained and increased both the productivity and quality of Russian life.